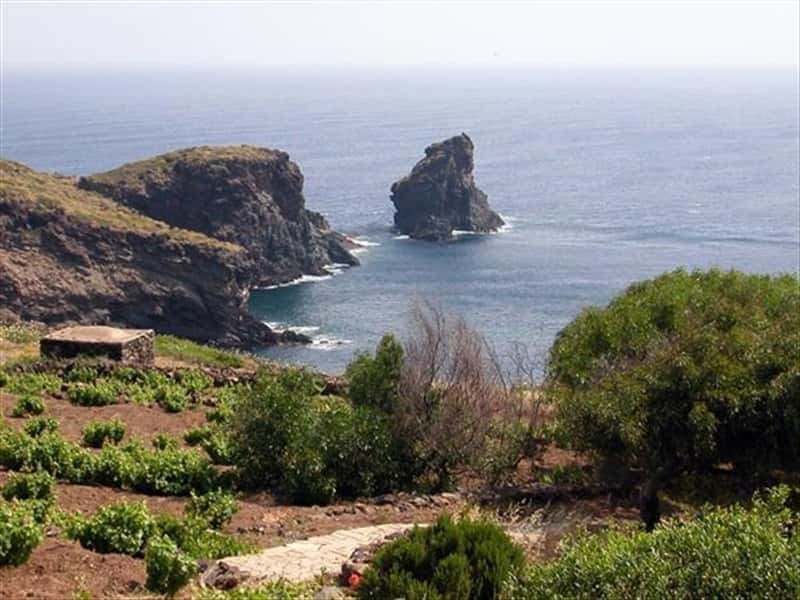 Of volcanic origin, Pantelleria is nearer to Africa than to Sicily. Called Cossyra by the Greeks, colonized by the Phoenicians who gave it a port which became a port of call between Africa and Sicily. The traditional residence of Pantelleria is the dammuso (of Arabian derivation) cube-shaped, made by squared stone called conci; the roof is a terrace that has some inflations in the centre with some very small openings. The island is endowed with a jagged coastline bathed by clear blue sea, that hides a wealth of varied marine life: its rocky slopes, fashioned by dry stone walling into terraces fit for cultivation, together with the local dammusi (typical kind of house) combine to confer upon the place an exceptional and unique beauty. The distinctive colours of the soil and base rock, which for the most part are basaltic, have earned the island a nickname, namely the black pearl of the Mediterranean". Passito di Pantelleria DOC wine is one of the specialties of this island, made with zibibbo grapes, is a sweet and fragranced dessert wine. This town web page has been visited 22,814 times.